Previously, I wrote about the affinity of certain mushrooms for cesium and their use for bioremediation. It seems fungi are not alone in their appetite for radionuclides. There is a class of bacteria that have been known for a long time to feed off of ionizing radiation. When exposed to x-rays, these bacteria are known to move towards the source of radiation, rather than away from it. The researchers mixed 90 grams of photosynthetic bacteria with alginic acid and other chemicals, forming the resulting granular material into marble-sized spheres. These were injected into 50 liters of concentrated sludge, whose radiation levels were monitored for three days. Radiation levels ranging from 12.04 to 14.54 microsieverts per hour at the start of the experiment were found to have dropped to between 2.6 and 4.1 microsieverts per hour by the end of the third day. Subtracting the 1.2 microsieverts of radiation that was detected in the area around the pool during the experiment due to the Fukushima No. 1 Nuclear Power Plant disaster, the bacteria was found to have reduced radiation levels in the sludge by a maximum of 89.4 percent. The negative charge of the surface of the bacteria used in the experiment has the property of attracting positively-charged materials, which it did with the positively-charged cesium. Moreover, the bacteria feed on potassium, and Sasaki says the bacteria likely absorbed the cesium because of its resemblance to potassium. Through dehydration and incineration, the volume of the used bacteria mixture can be reduced to a seventy-fifth of its original volume, and weight to a hundredth. Cesium turns into gas and is dispersed at 640 degrees Celsius, which can be avoided if temperatures are kept at 500 degrees or lower. According to V. Vysotskii and A.Kornilova, the radioactive 137Cs (half-life 30 years) can be destroyed by bacteria. In an experiment described at (1) they introduced 260,900 Bk of 137Cs into a solution containing several chemical substances and bacteria. By natural decay the activity after 100 days would be reduced by 1670 Bk. But the actually measured reduction of radioactivity, after 100 days, turned out to be 51,100 Bk, plus or minus 1000. In other words, the reduction due to bacteria was 29 times larger than the reduction due to natural decay. All activities were measured by placing small solution-containing flasks (2 by 2 by 2 cm) on top of the 1- cm-wide detector (2). Flasks were hermetically sealed, to make sure that cesium does not escape into the air, in the form of a volatile compound. Absence of accumulation of a solid cesium compound, gradually precipitating toward the bottom of the flask, was confirmed in a control experiment (during which 137Cs was decaying in the same chemical solution but without bacteria.) The decrease of radioactivity, during that experiment, was very close to the expected 1670 Bk. One of the interesting takeaways from that PDF is that what was most effective were synergistic communities of micro-organisms, rather than monocultures of one strain of bacteria or yeast. This should not surprise us at all from what we know about the web of multitudinous life forms that make up soil or the complex ecologies of bacteria that inhabit our own guts. Nothing in nature works in isolation. What we are talking about here is biological transmutation, which is based on theory outside of the mainstream of physics. One prominent promoter of this theory in Japan was reknowned macrobiotic teacher George Ohsawa. Considering the success macrobiotics has shown over the years in treating radiation illness, perhaps the theory should not be lightly dismissed. The contamination of groundwater with radionuclides and metals is one of the most challenging environmental problems at Department of Energy former nuclear weapons production sites. Researchers at the University of Massachusetts have previously found that Geobacter species can precipitate a wide range of radionuclides and metals (including uranium, technetium and chromium) from groundwater, preventing them from migrating to wells or rivers where they may pose a risk to humans and the environment. The analysis of the genome sequence revealed a number of capacities that had not been previously suspected from past research on this microbe. “We’ve provided a comprehensive picture that has led to fundamental changes in how scientists evaluate this microbe,” said Barbara Methe, the TIGR researcher who led the genome project and is the first author of the Science paper. “Research based on genome data has shown that this microbe can sense and move towards metallic substances, and in some cases can survive in environments with oxygen.” G. sulfurreducenswas previously thought to be an anaerobic organism. The other main project collaborator was Derek Lovley, a professor of microbiology at the University of Massachusetts, Amherst, who discovered the Geobacter family of bacteria and has led projects to assess their biology and their potential for bioremediation. Lovley said, “Sequencing the genome of Geobacter sulfurreducenshas radically changed our concepts of how this organism functions in subsurface environments.” The genome analysis, he said, “revealed previously unsuspected physiological properties” of the bacterium and also gave scientists insight into the metabolic mechanisms that the organism uses to harvest energy from the environment. Geobacter microbes are widely distributed in nature and are commonly found in subsurface environments contaminated with radionuclides and metals. Researchers have demonstrated that if they “feed” the microbes simple carbon sources such as acetate they will grow faster and precipitate more radionuclides and metals. These findings are now serving as the basis for a test of a bioremediation strategy aimed at removing uranium from groundwater at a Uranium Mill Tailings Remedial Action site near Rifle, Colorado. Geobacter sulfurreducens is not the only bacterium with the ability to induce profound changes in radioactive elements. There are a vast number of different types of bacteria that may be helpful in decontaminating land. Controlled experiments have been done using EM in Iitate Village, which was heavily affected by fallout from the Fukushima nuclear accident. The results are stunning. A summary report is presented here, while a detail report will be presented in October. A plot of 24a blueberry field was divided into a control section (with no EM application) and two experimental sections (with EM application). The experiment began in the 2nd week of May by making twice-a-week spraying of a mixture of 80 parts EMA (EM activated) and 20 parts phototrophic bacteria solution: 100L of the mixture per 10a in one experimental section and the same amount of the mixture with one time application of 250Kg rice bran per 10a in other experimental section. The preliminary measurement showed that cecium-137 level reached 20,000Bq per 1Kg soil. In order to reduce the radiation down below 5,000Bq (considered allowable for farming by Japanese government), EM mixture was sprayed twice per week. Interim report presents the results after 19 sprays (in about two months). Soil sampling was made in accordance with the sampling standards for environmental data prescribed by the Ministry of Education and Science and sent to a highly reputable Isotope Research to determine the level of cesium-137. The results were as follows. The level of 20,000Bq decreased by 40% in one month and by 75% by the end of the 2nd month to 5,000Bq which was allowable for planting rice. Farming is allowable now. A half-life of cesium-137 is about 30 years. When left as is in the nature, the level in the experimental field will be 10,000Bq after 30 years. It will take 60 years to reach the level of 5,000Bq. Other than rice farming, allowable level of radiation exposure has not been established for other crops and vegetable farming. The allowable level of cesium-137 for farm and marine produce is set below 500Bq. Needless to say; it is desirable when “not-detected”. In the area of Date city of Fukushima prefecture, there are many farmers who have used EM well over 15 years. 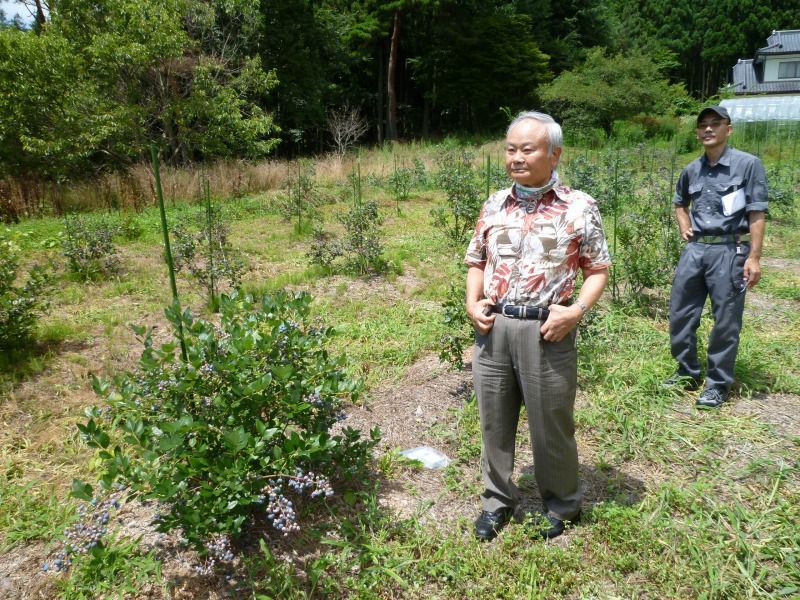 Mr. Makuta Takehiro has organized about 50 EM farmers under a supply chain management called “Agri-SCM”. The recent Tsunami and earthquake has forced approximately 10 farmers out of farming, leaving only 40 farmers in the group. In order to prevent unfounded conjecture, Mr. Makuta took the harvested crops and vegetables of “Agri-SCM” farmers to Isotope Research for radiation measurement, all of which results showed “not-detected”. According to Mr. Makuta, some farm products from low contamination areas have shown high concentration above the allowable level when EM application has not been made. All EM applied farm products from Kohriyama and Fukushima cities have proved “not-detected” level of radiation, which seems to indicate that EM farming can solve radiation problems. A lot more on the use of EM for bioremediation can be found here. While EM products are excellent products, they are often criticized for being costly. The bacteria and yeasts in the EM formula are abundant naturally-occurring bacteria normally present in soil and natural bodies of water. Anyone can brew their own version with a little effort and a dash of adventurousness. 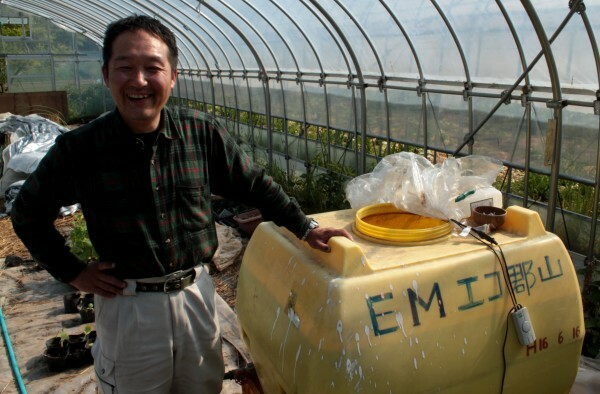 Iiyama Ichiro has been a professional in agricultural and bioremedial use of beneficial bacteria for many years in Japan, China and Korea. Iiyama is promoting the practice of homebrewing bacteria (fermenting) for internal use, for bathing, cleaning radiation around the home and for bioremediation of farmland. Here is his website in Engrish, which is barely comprehensible due to translation software, and not very informative anyway. There are also Japanese and Chinese versions, not sure how informative they are. His far-ranging Japanese blog is here. Here is a brief summary from a blogger whose Japanese wife is following Iiyama’s method of homebrewing. globlin), brown sugar, sea salt, and mineral water. the cap removed to allow the germs to breathe. water turns caramel-colored and smells like fruity vinegar. Here’s the rest of the blog post. Obviously, if bioremediation using bacteria is as effective as early results suggest, this is exhilirating news for Japan, Ukraine and the rest of the world. The ability to decontaminate the landscape quickly and inexpensively is a game-changer. The implications for human health are also very important. In my post on probiotics, I touched on the radioprotective power of probiotic foods. The ability of bacteria to transform radionuclides into harmless elements may be one of the reasons why probiotic foods are so effective in supporting the health of those affected by radiation. That’s all for now. Below is a list of links related to this topic. I hope to post more over the next few months. severity of the changes produced by uranium in the kidneys. It does this for all the heavy metals and other toxic chemicals including chemotherapy agents, which are highly lethal even in low dosages. After depleted uranium weapons were used starting in the first Gulf War, the United States has polluted the world with uranium oxide and it is showing up more and more in tests doctors perform. With a half life of several billion years we had better be prepared to get used to dealing with the toxic effects and help our bodies clear it more easily through the kidneys. Sodium bicarbonate is an absolute must item in any field hospital and it should be in used and recommended in all clinics and be present in every home medicine cabinet. So useful and strong is sodium bicarbonate that at Los Alamos National Laboratory in New Mexico, researcher Don York has used baking soda to clean soil contaminated with uranium.Sodium bicarbonate binds with uranium, separating it from the dirt; so far, York has removed as much as 92 percent of the uranium from contaminated soil samples. I started writing about baking soda after discovering that the United States Army recommends the use of bicarbonate to protect the kidneys from radiation damage. In this video, David Vitalis goes into detail about sauna and clay/zeolite for detoxifying radiation. I have a couple of nitpicks, but overall I think it’s a very good video. The two radionuclides of primary concern are iodine, cesium and strontium. Cesium and strontium are water soluble and stored primarily in muscle and bone respectively, so, yes, you can sweat out these radionuclides, but the point about sweating out fat-soluble toxins does not apply to these two in particular. However, other lypophillic (fat loving) toxins, such as mercury, must be cleansed as well. It is the overall toxic load that must be cleansed, not only radionuclides. Anyway, check out the video, and there is a lot more on that website I haven’t had the chance to take a look at, link below the video. How to Detoxify Radiation from Your Body — A Two Part Strategy with Daniel Vitalis | Health Beyond Hype.